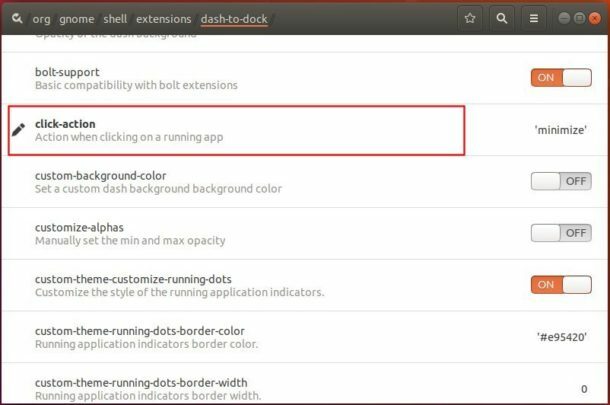 This quick tutorial shows you how to enable ‘Minimize on click’, the feather that minimize the running application window when you clicking on the icon in left launcher. While Settings and Gnome Tweaks utilities do not provide an option to toggle the action, you can enable the feature with Dconf Editor. 2. 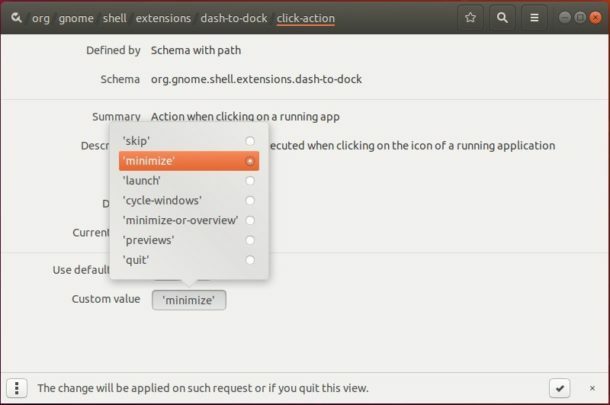 Then launch the tool and navigate to org -> gnome -> shell -> extensions -> dash-to-dock. Scroll download, and click go to settings for click-action. Nice. The only problem is that it disable the preview for running application with more than one windows, for example Chromium. Is there any way to show previews on hover? I am getting an error while using the command line method. GLib-GIO-Message: 02:08:19.075: Using the ‘memory’ GSettings backend. Your settings will not be saved or shared with other applications. And minimize doesn’t works. Can any you help? A great THANKS TO YOU BUDDY!!!!! !